Situated to the west of the Solow Building on a site that was once the home of the original Rizzoli Bookstore and several other low-slung buildings, 27-33 West 57th Street is one of the most prime sites on Billionare’s Row. The property is in the hands of developer LeFrak, and today YIMBY has the first look at what may eventually rise on the Midtown site in the near future. 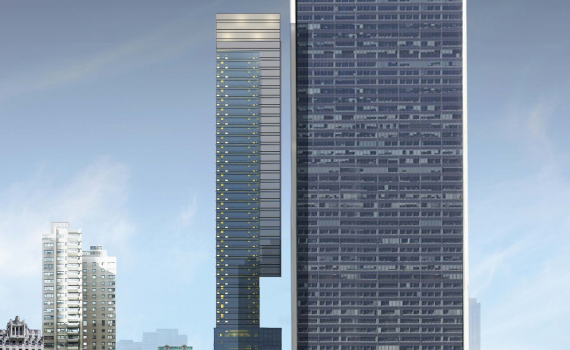 The rendering shows a relatively tall glass skyscraper, shorter than the Solow Building, with a noticeable cantilever starting several floors above street level on the eastern side. The plans bear a substantial resemblance to Central Park Tower being built to the west, by Columbus Circle. Not much has been said about the new rendering, or the type of building it will become, though another residential tower appears most likely. A six-star hotel had previously been mentioned as a possible occupant. It may not have a supertall status, but it does look like the occupants will have unimpeded views of Central Park since the majority of the building stands above the old pre-war buildings along 59th Street. No completion date has been announced. 16 Comments on "First Look For LeFrak’s Cantilevering 31 West 57th Street, Midtown Manhattan"
Please pardon me for using your space: It would be fine that I want to face new progress. Especially development news. Before moving to West 57th Street, wasn’t the “original” Rizzoli’s on Fifth Avenue where Henri Bendel is now situated? Deplorable — not just the building itself, but the context. I would love to someday soon, see a developer build something similar to the Singer building or a throwback Art Deco designed structure. I think that would be so cool! I don’t see the point for such Cantilevering. Just makes a building more fragile for no reason. Have they given a reason for the seemingly pointless cantilever? Pardon my space usage: What a shame to have lost such lovely buildings for this uninspired design. Uncreative and certainly not eye appealing. With the exception of the cantilever, it looks like something they’d cook up over in the Windy City. Side note- I love Chicago but their modern architecture is a far cry from NYC. A simple corner support pillar would make this building a lot less alarming. Cantveiler, for what reason??? Just for ruin the view to the next Sollow Tower Monolith, this modernist brutalist monolithic must be next NYC landmark, but that LeFrac proposal simple not to belong here, period!!! YIMBY, you need to speak out on this. You must admit it’s ugly and out of place. God awful compared to the former Piano building which once was graced the west side of the Solow building. It cast wonderful reflections of colorful masonry and terracotta ornamentation upon the curving glass. A wonderful and unexpected gift to the pedestrians on 57th Street to see. This one will only cast a hulking shadow. Horrible design.